Simply Living: Well hello Mr. and Mrs. Owl! I heard the owl before I saw it. Actually, the loud screeching noise coming from the edge of the woods sounded more like a small animal under distress than a large bird bellowing its call in the fading light of early evening. Yet an owl it was. A great horned owl, Bubo virginianus. I followed the sound until I came to a pine tree, one of many two-decade-old slash pines about 50 feet back from the lakeshore. Looking up, I spotted a large, big-eyed, tufted-eared bird perched on a branch looking down at me. Obviously, the owl’s spotting skills were better honed than mine. The longer I stood watching — about 15 minutes — the less concerned the owl became with my presence. Instead of flying off or trying to scare me away, the owl graciously ignored me after a short assessment. The raptor’s large yellow eyes shifted away from my face and refocused on surveying the surroundings. In most situations, being ignored feels offensive but when it comes to observing wildlife an animal’s willing disregard is a gift. When the owl tired of looking at me, it returned to its previous business and so did I. I began snapping photos and a short video. I watched the bird turn its brownish tan head almost completely around to check out perceived sounds or movements. I was surprised by how puffed out its white-feathered throat became when it emitted muffled calls and I chuckled inwardly at its animated display of head-bobbing. I saw the owl’s brownish-black beak open and snap shut. I watched it yawn and eventually I followed its flight as it flew off the pine bough on wings so silent that, had I not been there watching, I would have missed it entirely. Since the evening when I first discovered the great horned owl in the pine tree, I’ve seen the same bird several more times and a second bird, too, which I assume is its mate. Now that I know what to listen for, my ears perk up whenever I go outside. Especially at dusk or just before sunrise. I’ve seen the owls most often in the early morning when I’m out rowing. The two birds are usually in the same tree where I spotted the first one. Can you spot both owls? Even if I don’t hear its call, my eyes still scan the pine branches carefully as my oars cut quietly through the still water. Quite often my diligence has been rewarded by discovering one or both owls perched patiently in the tree. 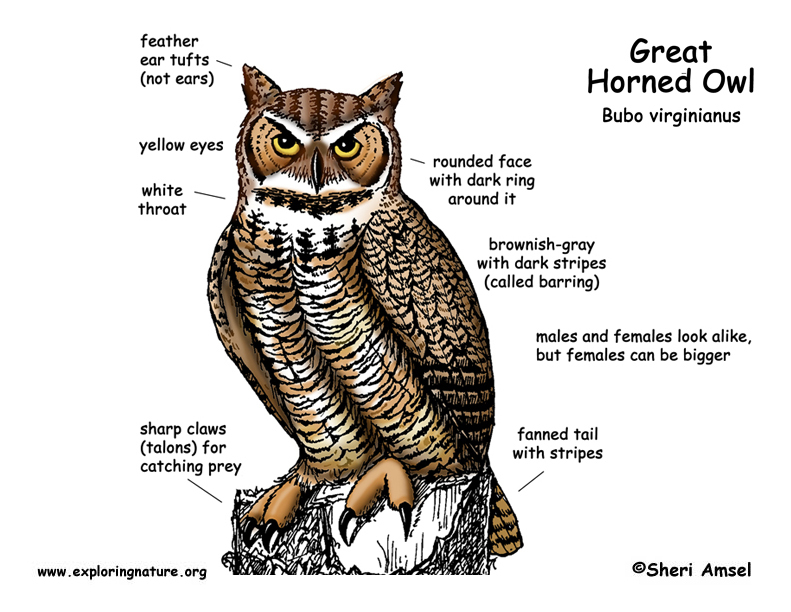 Great horned owls are considered common birds. Breeding populations are estimated at about 3 million throughout the U.S. with another 3 million spread across Mexico and Canada in almost all habitats except tundra and treeless grasslands. Their diet is almost as diverse as their widespread range. These 2- to 3-pound carnivores eat everything from small mammals such as squirrels, skunks, house cats, mice, moles, rabbits and rats to larger mammals including bobcats, raccoons and young alligators. As equal-opportunity feeders, they willingly prey upon frogs, fish, eels, songbirds, shorebirds, snakes, scorpions, even other owls and the occasion meal of carrion. By examining owl pellets, biologists have identified 250 different species of mammals, reptiles, amphibians, fish, birds and invertebrates consumed by these dietarily indiscriminating predators. The hunting skills of these large owls are aided by exceptionally well-camouflaged plumage, fine-tuned hearing, excellent eyesight and extremely large, sharp talons with which to grab, stab and instantly kill their projected targets. Although the usual method of these stealthy nocturnal hunters is to patiently wait on a tree branch for potential prey to pass below, they’re not averse to also wading in water, walking on land or gliding slowly just above ground in search of food. Although I have now been able to observe the pair of great horned owls on our property several times, I have yet to see one actually catch prey. But that just gives me another experience to look forward to. Whether observing from the water or while walking quietly through the woods, my senses are on alert for a new-to-me critter that has taken up residence on our property. Lucky doesn’t begin to describe the swell of emotions I feel for this recent addition to our wildlife roll call.